A group at Brown University ported version 9 to the IBM RT PC, but problems with reading unaligned data on the RT forced an incompatible protocol change, leading to version 10 in late 1985. By 1986, outside organizations had begun asking for X. X10R2 was released in January 1986, then X10R3 in February 1986. Although MIT had licensed X6 to some outside groups for a fee, it decided at this time to license X10R3 and future versions under what became known as the MIT License, intending to popularize X further and, in return, hoping that many more applications would become available. X10R3 became the first version to achieve wide deployment, with both DEC and Hewlett-Packard releasing products based on it. Other groups ported X10 to Apollo and to Sun workstations and even to the IBM PC/AT. Demonstrations of the first commercial application for X (a mechanical computer-aided engineering system from Cognition Inc. that ran on VAXes and remotely displayed on PCs running an X server ported by Jim Fulton and Jan Hardenbergh) took place at the Autofact trade show at that time. 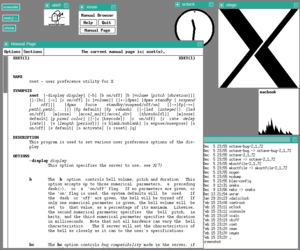 The last version of X10, X10R4, appeared in December 1986. 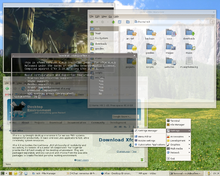 Attempts were made to enable X servers as real-time collaboration devices, much as Virtual Network Computing (VNC) would later allow a desktop to be shared. One such early effort was Philip J. Gust's SharedX tool. By the late 1980s X was, Simson Garfinkel wrote in 1989, "Athena's most important single achievement to date". DEC reportedly believed that its development alone had made the company's donation to MIT worthwhile. Gettys joined the design team for the VAXstation 2000 to ensure that X—which DEC called DECwindows—would run on it, and the company assigned 1,200 employees to port X to both Ultrix and VMS. In 1987, with the success of X11 becoming apparent, MIT wished to relinquish the stewardship of X, but at a June 1987 meeting with nine vendors, the vendors told MIT that they believed in the need for a neutral party to keep X from fragmenting in the marketplace. In January 1988, the MIT X Consortium formed as a non-profit vendor group, with Scheifler as director, to direct the future development of X in a neutral atmosphere inclusive of commercial and educational interests. Old version, no longer supported: X10 November 1985 IBM RT PC, AT (running DOS), and others. ^ "Licenses". X11 documentation. X.org. 19 December 2005. Retrieved 23 October 2007. ^ a b "The X-Windows Disaster". Art.Net. Retrieved 10 November 2009. ^ "Orca". wiki.gnome.org. 24 November 2011. Retrieved 7 November 2012. ^ "ATK - Accessibility Toolkit". developer.gnome.org. Retrieved 7 November 2012. ^ "KDE Accessibility". KDE e.V. Retrieved 6 January 2013. ^ Diavatis, Alex (11 June 2013). "Wayland in Raspberry ¦ Wayland in GNOME". World Of Gnome. ^ "MirSpec – Ubuntu Wiki". Wiki.ubuntu.com. Retrieved 6 March 2013. ^ "Debut of X". Talisman. 19 June 1984. Retrieved 7 November 2012. ^ Garfinkel, Simson L. (November – December 1988). "A Second Wind for Athena" (PDF). Technology Review. Retrieved 25 January 2016. ^ Garfinkel, Simson L. (May – June 1989). "Ripples Across the Academic Market" (PDF). Technology Review. pp. 9–13. Retrieved 25 January 2016. ^ Browne, Christopher. "X11R6.4 Sample Implementation Changes and Concerns". Christopher Browne's Web Pages. Archived from the original on 1 June 2008. ^ Theo de Raadt (16 February 2004). "openbsd-misc Mailing List: XFree86 license". MARC. Archived from the original on 8 December 2009. Retrieved 8 December 2009. ^ Gettys, James; Packard, Keith (2004). The (Re) Architecture of the X Window System (PDF). Proc. Linux Symposium. 1. ^ "The Current XFree86® Release: 4.8.0". xfree86.org. ^ Landau, Matt (23 April 1993). "Re: Asynchronous X Windows?". Newsgroup: comp.windows.x. Usenet: 1rccdq$s6s@armory.centerline.com. Retrieved 6 March 2013. ^ e.g. "X Windows FAQ", the FAQ for Usenet newsgroup comp.windows.x. ^ X server version 1.4 release plans. Retrieved 25 August 2007. ^ "Foundation Releases X7.4". X.org. Retrieved 10 November 2009. ^ "7.5 release announcement". X.org. Retrieved 10 November 2009. ^ "Wiki – 7.5 release plans". X.org. Retrieved 10 November 2009. ^ "7.6 release announcement". X.org. 20 December 2010. Retrieved 21 December 2010. ^ "Thinking towards 7.6 katamari, including xcb". Lists.x.org. Retrieved 10 November 2009. ^ "Wiki – 7.6 release plans". X.org. Retrieved 21 December 2010. ^ "[ANNOUNCE] X11R7.7". Lists.x.org. Retrieved 7 June 2012. ^ "Releases/7.7". X.org. Retrieved 7 June 2012. ^ "Releases/7.8". X.org. Retrieved 6 May 2014.